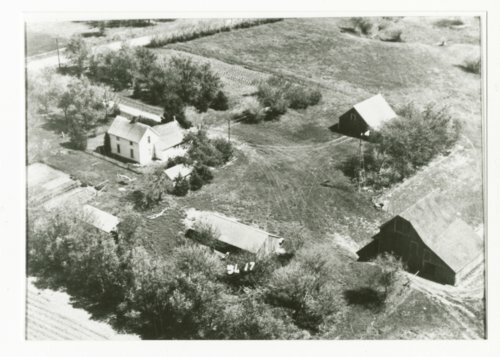 This is an aerial photograph showing William Jolitz's farm located near Talmage in Dickinson County, Kansas. The road in the upper left portion of the photograph passes by the pasture, potato patch, windbreak, and a lane enters the property. To the right of the house, is the granary, windmill, barn, chicken coop, brooder house and wash house. A tornado destroyed all the buildings except the chicken coop.